This post contains a summary of key farm safety net provisions. Details are minimized to focus on key features. A few brief observations conclude the post. Mistakes are possible given the short turn-around time and interpretation of bill language. Apology is extended for any mistakes. Direct payments are repealed except for reduced transition payments to cotton for the 2014 crop and even smaller payments for the 2015 crop under specified, limited conditions. PLC payments occur if U.S. average market price for the crop year is less than the crop’s reference price. Reference prices are: wheat, $5.50/bushel; corn, $3.70/bushel; grain sorghum, $3.95/bushel; barley, $4.95/bushel; oats, $2.40/bushel; long grain rice, $14.00/hundredweight (cwt). ; medium grain rice, $14.00/cwt. ; soybeans, $8.40/bushel; other oilseeds, $20.15/cwt. ; peanuts $535.00/ton; dry peas, $11.00/cwt. ; lentils, $19.97/cwt. ; small chickpeas, $19.04/cwt. ; and large chickpeas, $21.54/cwt. For both PLC and county ARC, payment acres for a crop are 85% of the farm’s base acres for the crop plus any generic base acres (former cotton base acres) planted to the crop. Individual ARC payments acres are 65% of the sum of the farm’s total base acres and any generic base acres planted to covered crops on the farm. Total base acres on a farm are the same as current base acres. However a farm can elect to reallocate base acres among the farm’s covered crops according to each covered crop’s share of the farm’s total acres planted to covered crops over the 2009-2012 crop years. PLC payment yields can be updated to 90% of the farm’s average planted yield over the 2008-2012 crop years. The 2008 Farm Bill’s nonrecourse marketing loan and loan deficiency payment program and associated loan rates are extended, except for modifications to the loan rate for cotton, which now can range between 45 and 52 cents per pound. Supplemental Coverage Option (SCO) provides farms the option to purchase county level insurance that covers part of the deductible under their individual yield and revenue loss policy. Coverage level cannot exceed the difference between 86% and the coverage level in the individual policy. Subsidy rate is 65%. SCO is not available if enrolled in ARC. A slightly different Stacked Income Protection Plan (STAX) is offered for cotton. Implementation begins the 2015 crop year. A new revenue-minus-cost margin crop insurance contract is authorized. The initial target is rice for the 2015 crop year. The PLC – ARC decision involves many considerations, but a key one is the level of downside protection. Figure 1 presents a very crude, first look at this consideration in the context of the PLC – county ARC decision (individual ARC is not considered here). 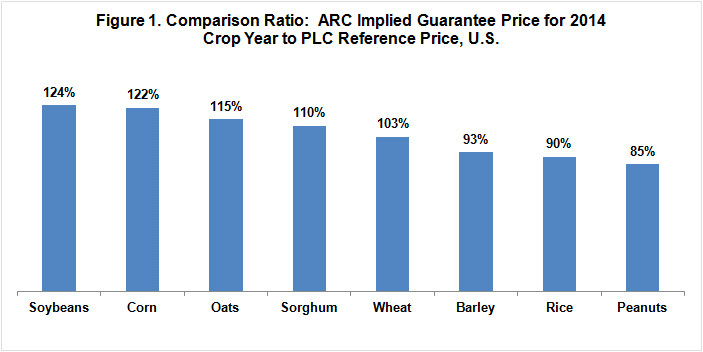 Figure 1 compares the estimated implied guarantee price for ARC to the PLC reference price for the 2014 crop year. The ARC implied reference price equals ARC’s coverage level of 86% times the Olympic average U.S. price for the 2009-2013 crop years. This comparison suggests that for 2014 ARC’s’ price coverage level is more favorable for corn and soybeans while PLC’s reference price is more favorable for peanuts, rice, and barley. The figure implies the same farm may choose different programs for different crops, a feature this farm bill allows. However, Figure 1 is only a starting point because the decision involves all 5 crop years between 2014 and 2018 and comparing price (PLC) vs. revenue (ARC) programs, fixed (PLC) vs. moving average (ARC) programs, and other important differences. Farmdocs will offer more detailed and complete discussion of these decision options in the future. Much has been made of the delay in completing this farm bill, including the implication that the farm lobby has lost power. I suggest caution. It is quite an accomplishment to complete a farm bill in the current divided political environment. Few initiatives have gotten this far. This farm bill was the first to be distinctly impacted by multilateral international trade agreements. Cotton will eventually have no safety net against multiple year low returns, an unlikely outcome without the World Trade Organization ruling in the U.S.-Brazil cotton case. It should give pause to U.S. farm safety net supporters about the consequences if programs become too generous. Due to its size but also expansion in this farm bill, cost and performance of crop insurance will likely be a notable focus of the next farm bill debate. Last, this farm bill did not settle the question of what is the best policy for multiple year assistance, price or revenue and fixed vs. moving targets. The next farm bill will continue this debate but with experiences that at present appear likely to be based on a more normal, potentially low, income. In other words, the context of the next farm bill debate will likely significantly differ from the context of this farm bill debate, raising the potential for different outcomes.